I [heart] Davids · Vroom-vroom-Roomba! Depending on the model, the Roomba will turn on at a specified time, undock itself from its charging station, and then go clean its appointed area. It cautiously beep-beep-beeps as it backs of its dock — how adorable! If it finds areas with higher concentrations of dirt, it will focus on that area. It will switch from carpet to tile to hardwoods effortlessly. When its program is finished, or when the battery is getting low, it will go back to its dock and settle in for a nice recharging nap. Of course, it doesn’t always work that way. The 400 model series don’t have a home base to return to, so you have to find the Roomba whereever it died, then plug it in to recharge it. They also don’t have scheduling capabilities. On the other hand, several of the 500 models have known flaws in the design and require a little more frequent maintenance or replacement of parts. 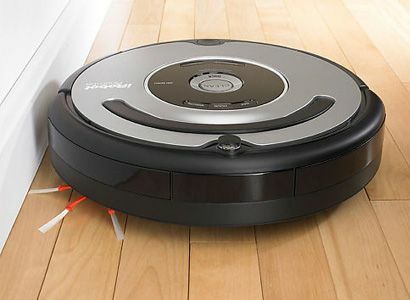 A Roomba with basic features (the Roomba Red) starts at $150, but there is no self-charging home base with that model. The 500 series Roombas, which have more features and more standard accessories, start around $250 and seem to have some enduring flaws. Top-of-the-line Roombas can sell for as much as $550. On the other hand, there are used Roombas of all flavors on Craigslist, ranging from $75 – $350. Some of these are unopened, new-in-box. Some of them are “gently used” and some are probably two years old or older. Everything I’ve read about Roombas say pretty much the same thing: “It worked great while it lasted.” That means if I get a new one, it might only last two years before pooping out on me. Which makes paying full price for a new one a bit hard to swallow. On the other hand, if I buy a used one the life expectancy may be significantly shortened, but I won’t be out that much cash. But buying electronics from a person off the street with no warranty protection just seems nutty. Another idea I had was to buy one at full price and use it for a few weeks, then return it. That way I could evaluate just how much I like it and how handy it is. That might help me make a purchase decision. My neighbor has one and she LOVES it. I remember her saying that it’s her 2nd one but that it doesn’t matter because she will keep buying them when they go to Roomba heaven. I can get more specific info from her if you likey?